The pearl is the oyster’s autobiography, they go great with anything! 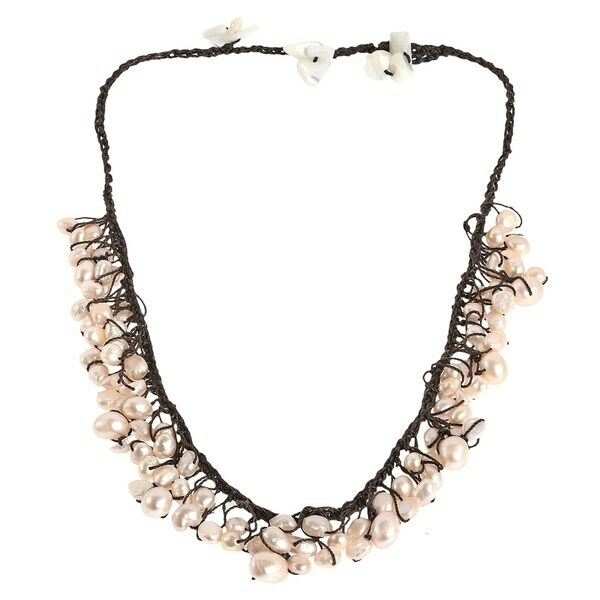 Droplets of freshwater pearls adorn this necklace from Thailand. Crafted by hand, this necklace hangs on cotton rope strands. My name is Thidarat I am a full time Thai government employee working in Bangkok. I love to design and craft the jewelry by myself. I am happy when I see others appreciate my designs. This inspires me to make more beautiful jewelry. My designs are made by friends and family in Lamphun, the northern province of Thailand. My satisfaction comes from the pride of being able to create work and income for the people back home so that they can have a better life. All weights and measurements are approximate and may vary slightly from the listed information. Treatment code N (freshwater pearl). See Treatment Guide for further information. This necklace is very pretty and can go well with many outfits! I am very happy with this purchase! It's a very delicate necklace. It has an adjustable length. I just love it.